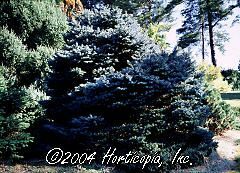 A dwarf form of Colorado Blue Spruce. Excellent powder blue to gray-blue color. Maintains a slightly conical to broadly mounding shape.